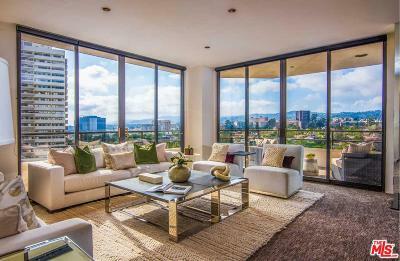 Rare opportunity to own a northwest corner unit in one of LA's most prestigious high-rises, Wilshire House. Commanding panoramic views of the city, mountains and ocean, unit 1204 is the definition of sophistication and class. Formal entry hallway leads into an expansive living room with floor to ceiling windows framing unobstructed views of The Getty Center and surrounding mountains. Adjacent office with custom built-in can be used as a den or easily converted into a third bedroom. Elegant master retreat features a marble fireplace, sitting area, dual walk-in closets and sumptuous bathroom. Enjoy impressive city and ocean views from the formal dining room and bright gourmet kitchen with separate eat-in area. Additional features include high ceilings, wrap around balconies, and custom window shades throughout. Full service building with 24-hour concierge, security, valet parking, fitness center, pool/spa, and N/S tennis court.